Today, Cyndi Lauper and the True Colors Fund, in partnership with the National Law Center on Homelessness & Poverty, unveiled the State Index on Youth Homelessness –a first-of-its-kind resource that evaluates all 50 states and the District of Columbia on their efforts to prevent and end youth homelessness. The two organizations have also launched a campaign to empower the public to contact their governors to improve their state’s index scores. According to a recent study by Chapin Hall at the University of Chicago, one in 30 youth ages 13 to 17 and one in 10 young adults ages 18 to 25 endure some form of homelessness in the U.S. each year. The study also found that lesbian, gay, bisexual, transgender, queer, and questioning (LGBTQ) youth are 120% more likely to experience homelessness than non-LGBTQ youth. The State Index on Youth Homelessness takes LGBTQ inclusion into account in its findings and provides recommendations on how states can address the unique needs of LGBTQ youth. 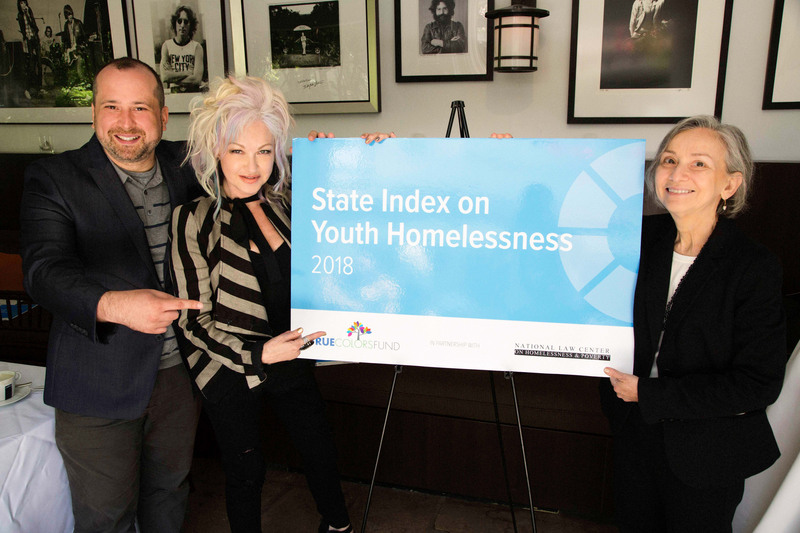 As the True Colors Fund launches its tenth anniversary celebration this month, the State Index is the latest example of Cyndi Lauper’s and the organization's commitment to ending homelessness among LGBTQ youth through federal, state, and local public policy efforts. Lauper has been an unwavering advocate for equality throughout her entire life, which lead to her co-founding the True Colors Fund in June 2008. Today, the True Colors Fund is the national leader on preventing and ending LGBTQ youth homelessness and is fulfilling its mission through a broad array of advocacy, training and education, and youth collaboration programs. For nearly 30 years, the National Law Center on Homelessness & Poverty (the Law Center) has used the power of the law to prevent and end homelessness in America. Maria Foscarinis, who founded the Law Center in 1989, has advocated for solutions to homelessness at the national level since 1985, having served as a primary architect of the Stewart B. McKinney Homeless Assistance Act, the first major federal legislation addressing homelessness. Today, the Law Center serves over 3.5 million Americans experiencing homelessness through impact litigation, policy advocacy, and public education. The Law Center also provides training and technical assistance to schools and advocates, and legal support to families, to ensure children have access to quality education under the federal McKinney-Vento Homeless Assistance Act.